I've been attending Chicago Hack Night events for at least 2 years and I'm writing this article to help celebrate their 200th weekly gathering. This image is from this week's event, where the Heartland Alliance presented information. You can see me in the middle, sitting by the wall. That's my usual spot. Helps me see better. So why do I attend? First, I'm not a technologist. I've been using technology as a tool to work smarter, think better, share ideas and network with others since the early 1980s. I attend Hack Night meetings because I'm inspired by the ideas shared by speakers. I'm inspired by the talent and the work being done by people who are attending. I'm also hoping to share from my own knowledge and experiences, while finding volunteers to help with my own work. Here's a few highlights from my journey through technology and innovation, starting in 1980, when I was one of the first people at the Montgomery Ward Corporate Office in Chicago to have an Apple Lisa on their desk. 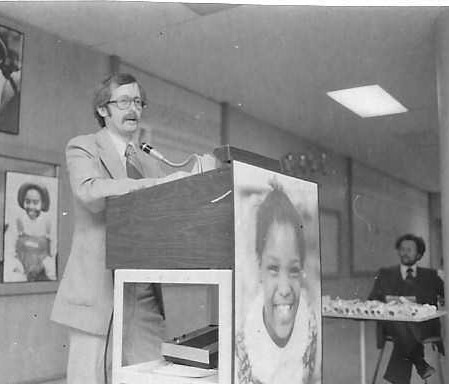 Ron Mantegna and Ken Novak, peers in the Retail Advertising department, were the catalysts who suggested that using the computer to create ad diagrams and update them would be more time efficient that doing them by hand, since the company changed ad plans so frequently. At first, pepole laughed at me sitting at the computer, and called it a toy. By 1990 the entire multi million dollar ad planning and development process at Montgomery Ward was computerized based on the work we started in the early 1980s. I tell this story because it has repeated over and over for the past 30 years. Others with better knowledge of how computers and the Internet work have prodded me to adopt new ideas and have supplied the tech talent to help me implement those ideas. In the early 1980s it was Ken Novak who introduced me to Excel and helped me create a forecasting system that was used in the advertising planning process and generated millions of dollars of benefit. Later it was Ken who introduced new versions of technology, and this idea called "email". 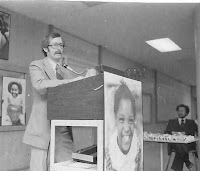 As I applied these tools for my retail advertising job, I also applied them in my role as the volunteer leader of the tutoring program at Montgomery Ward. While we spent millions on mass communications to draw people to 400 stores around the country, I spent time and talent to create mass communications (starting with duplicating machines) that told our 200-300 volunteers what to expect each week at the tutoring sessions. In 1997 my first web site was created by the brother of one of our volunteers. Then, in 1998, Matt Mead, another one of our volunteers, said "I understand you're trying to build a web site. I can do that for you." When Matt and I started talking I said "We'll need people with different talents to help us." 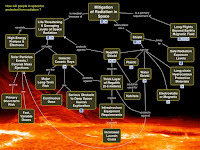 So, he created this graphic as the home page for the www.tutormentorconnection.org site that he built for me, using a technology called 'revista' which enabled me to edit text on the site. In 2005 this site was rebuilt using dot.net.nuke, by a team from IUPUI in Indianapolis. I've used this hub and spoke design over and over since then to communicate how I was trying to connect others to myself, and each other, in a constantly growing community of people and ideas focused on helping inner-city kids have the extra support they each need to move through school and into jobs. In 1999, Steve Roussos, who was then a PhD student at the university of Kansas, used power point to create this visualization to describe the work I was doing. 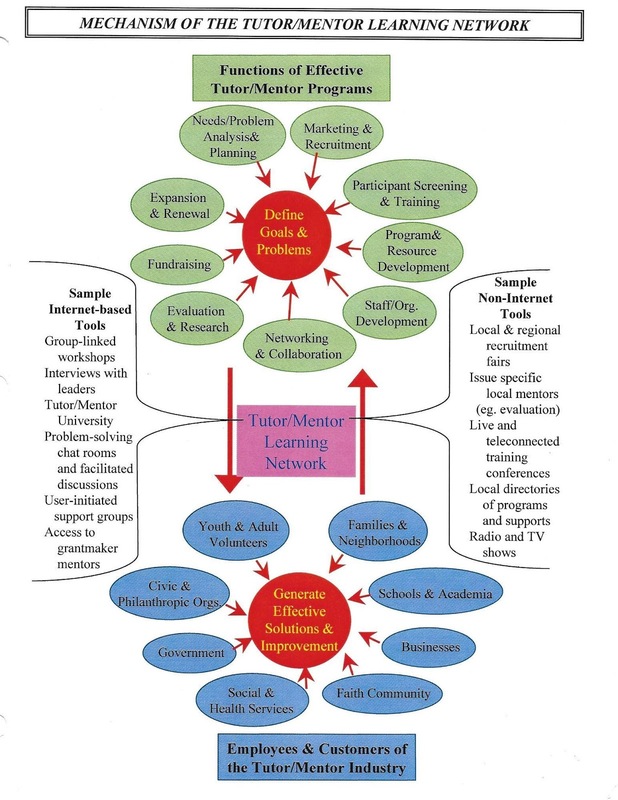 He called it a "Tutor/Mentor Learning Network", and drafted this paper to describe it to donors. I've built hundreds of power point presentations since then, inspired by Steve's work, including this PDF. Steve was also the creator of the www.tutormentorexchange.net web site in 1998, which now is the home site for the Tutor/Mentor Institute, LLC. In 2000-2001, he also created an on-line documentation system called OHATS (Organizational History and Tracking System), modeled after work being done from the University of Kansas. While I started collecting information about Chicago tutor/mentor programs in 1993, I did not have an idea of how to display that information until the librarian at the United Way/Crusade of Mercy showed me a geography magazine, and one of my volunteers at IBM introduced me to GIS mapping, and to the Metro Chicago Information Center in 1993. 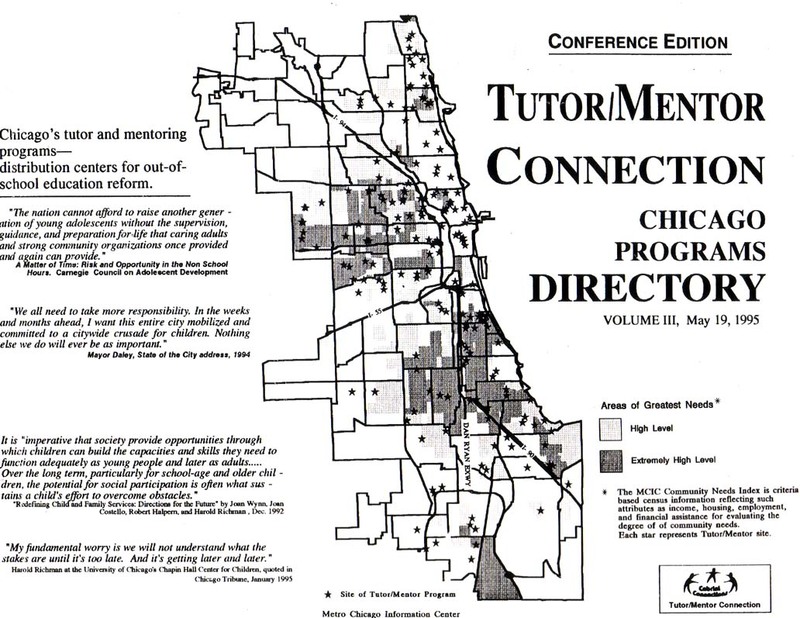 I started mapping the database of programs in 1994 and published the first Chicago Tutor/Mentor Programs Directory in 1995, with contact information and address for more than 120 different youth serving organizations, along with dozens of more organizations who were working in some way to improve the life-outcomes for kids in poverty. When I started the T/MC web site in 1998 this list of other organizations became the core of a web library that now points to more than 2000 other web sites, including Chicago Hack Night and similar data networking groups. 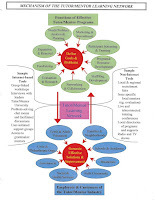 If you look at the link to the web library, you'll see it's outlined using a concept map (CMAP tools), which was introduced to me by a former Peace Corps worker in 2005. I've created a whole library of concept maps since then. In 2004 an intern from IIT and India recognized my goal of sharing this information on the Internet, and created a searchable program locator that duplicated what was in the printed Directory. This enabled users to search by zip code, type of program and age group served, to produce a map showing that program, and others in the same zip code. In 2007 another volunteer from India, added an interactive map feature to the program locator, enabling us to zoom into neighborhoods to not only find organizations based on age group, type of program and time of day, but to also see indicators showing where the programs are most needed, and what assets were in that area who could be collaborating to help sustain existing programs or build new programs. Now (when this is working properly) users can create their own neighborhood map view, to help bring others together to help support existing program or build new ones to fill voids. This PDF describes how to make your own map using this program locator, or other data maps that now are available on the internet. Browse this blog, and the Tutor/Mentor blog, and you'll find many examples of this type of map-story. 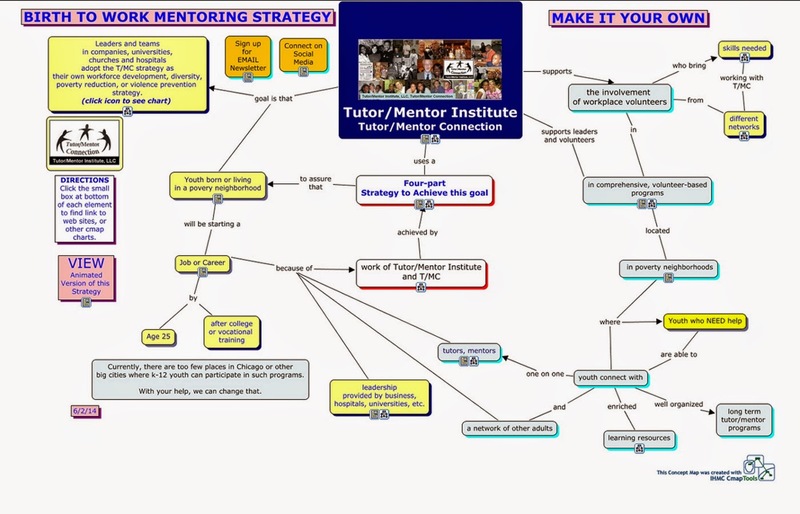 In 2009 Valdis Krebs, one of the world's foremost experts on Social Network Analysis, spoke at the Tutor/Mentor Conference that I hosted in Chicago, then donated software that interns could use to create maps showing participation in Tutor/Mentor Conferences. 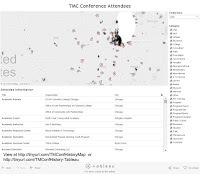 This blog shows maps created in 2010. This article shows how I'm still trying to find interns and volunteers to create maps and visualizations that show how networks grow as a result of the work I and other innovators do. 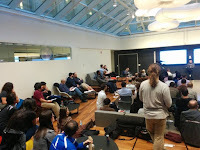 When I attend Chicago Hack Night and similar gatherings of tech and data visualization people, I'm trying to connect with talented people who will help me continue to build tools and visualizations that bring people and ideas together and focus actions on places where time, talent and dollars will be needed for many, many years. I'm also sharing ideas from my own experiences and library, that others can apply in their own work. The Chicago Hack Night has a tradition of letting everyone introduce themselves at the beginning of each week's gathering. As I do this, I am posting my intro on Twitter, as I did this week. Last September I saw a Tweet with a network analysis map like this. I followed it and introduced myself to Marc Smith, who then pointed me to information that I could use to learn about NodeXL, and how I could ask him to create similar maps for me. I created this tutorial so others could learn from my own journey. If every participant of a networking event, or conference, hosted by someone in Chicago or another city, were to post a tweet with #chihacknight , etc. 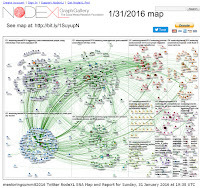 maps using NODEXL could show who was participating and how they are connected to each other. Such maps can demonstrate the impact event organizers are having, while also helping participants expand their own networks and find talent and sponsors who will help them with the work they are doing. I really appreciate Chicago Hack Night and it's organizers and sponsors for creating a space where I can be inspired by the work of others, where I can share ideas that any of the participants might apply in their own work, and where I might find people who will volunteer time, talent and dollars to help me keep doing what I've been trying to do for the past 20 years. I encourage anyone who has read this far to go to this site and see the many ways Chicago Hack Night is supporting technology innovation in Chicago. Thus, I'm not a data scientist, or coder, and I depend on the talent of other people to create and maintain the technology platforms that share my ideas and bring people together to help youth in high poverty areas of Chicago. The examples posted on this blog are just a few showing how others have helped me in the past, and can help me again in the future. They also may serve as inspiration for a project someone in Chicago, or elsewhere in the world, will develop and apply in the future. While I'm not able to stay each week and contribute on the many projects in process, I'm available to connect between sessions to offer suggestions and/or point people to some of the resources and ideas I share. Just Tweet me @tutormentorteam or introduce yourself in the comment section below. 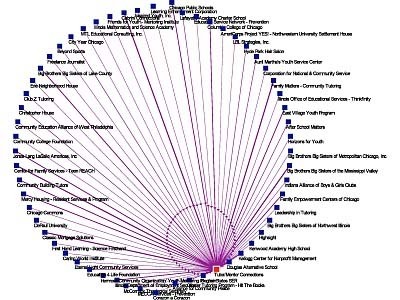 I created this concept map in the mid 2000s to show a commitment of "helping all kids born or living in poverty in Chicago be starting jobs/careers by age 25" that needs to be shared by many. A version of this on a web site would demonstrate that commitment. This map is really an entry point to layers and layers of addition information, representing available knowledge as well as needed strategies that draw people together and generate a flow of ideas, talent and operating dollars to all of the people who are involved in this work in the same neighborhood and/or city. The map shown above map is an outline of the web library I've been building since 1998, which was really started in the mid 1970s as a paper-based library. Open nodes on the map and you eventually will get to a list of organizations which you can open to dig even deeper into the information that's available. It's like going to a university. The information available is much more than can be learned and absorbed in a day, or even over many years. Yet, the more people dig into the information, the broader the range of ideas and strategies they will have to solve problems of poverty, inequality, social justice and workforce development. Last September I connected with Marc Smith, one of the leaders of a network analysis project called NodeXL. I wrote this blog article as a tutorial for those interested in learning more about what this is, and why it is important. I wrote another article in February, following the National Mentoring Conference. Today, I listened to Marc talk to a group of students at Indiana University, via this YouTube video. I hope you'll take the time to listen and to read my blog articles. 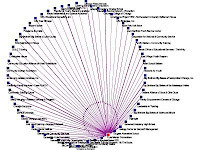 In the concept map above and my web library, I point to more than 2000 other web sites. More than 200 of those are youth serving organizations in Chicago. Others are research organizations, funders, or people who share ideas about collaboration, process improvement, knowledge management, etc. Many of the sites I point to have their own resource sections, thus pointing to even more web sites. By hosting this information on the Internet via blogs and web sites, I create the opportunity that on any given day someone from one of the organizations I point to can be digging into the information on my web sites and starting a conversation with someone else. The problem is, we don't know if this is happening, and how often. We don't know who is looking at the information, or connecting to us or each other, so we also don't know who still needs to be engaged. Marc talks about how the #hashtags we use on social media enable us to track topics that people talk about. He shows how the handle we use, like @tutormentorteam, can be captured using a network analysis tool like Node XL, to create a map showing who was involved in a conversation on a specific set of days, how they were connected to others, if the were, and what type of connectivity is taking place. I hosted Tutor/Mentor Leadership and Networking Conferences every six months from May 1994 to May 2015, and one of the goals was to help build relationships between participants, and to connect participants to myself and the library of information and ideas I host. Another was to create an on-line community where more people can connect, and where everyone has a chance to talk and express their own ideas. 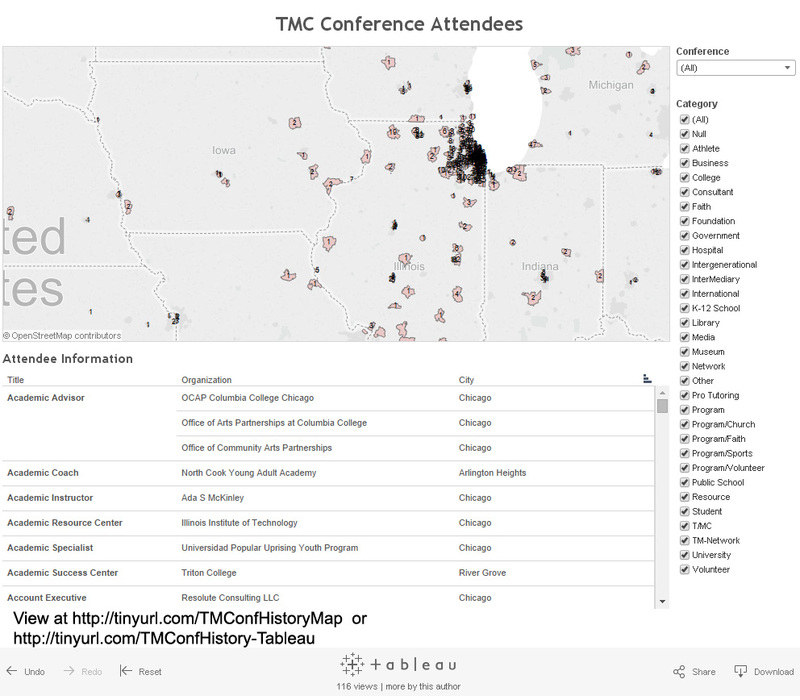 Visit this page and you can see what organizations were part of each conference. So far, I don't see many in the social service field, or in the narrower tutor/mentor field, trying to use maps to show participation in events they host, or in on-line conversations. I also don't see any who are trying to show impact, by showing network maps of individual youth and/or volunteers who participate in their programs. 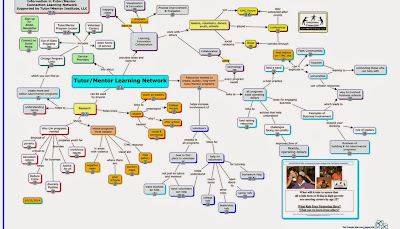 I've written a variety of articles focused on network building, network analysis and networking that illustrate my ideas, and why understanding who you are connecting to is a critical first step in building the type of network that is needed to build and sustain a mentor-rich system of supports that will help more youth move safely through school and into jobs and careers. 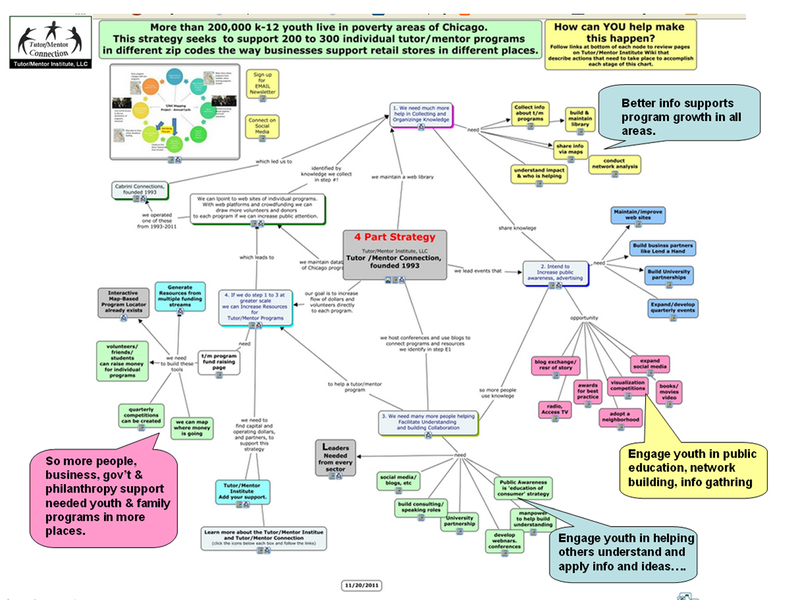 Last week I posted an article, with this concept map, which shows the four part strategy I've developed over the past 20 years, and the work that needs to be done to enhance each step. I posted another article on Monday, on the Tutor/Mentor blog. I hope you'll read them, and share them with people in your own network. I'm just one person with few skills and little funding, but with a broad vision. There's room for many to share this work, but we need to be connected, and we need to be using tools that show how we're connected and that enable others to join in. By sharing this and other articles I create the possibility that one or more readers will forward this to others, who forward it to even more. One of those people will be the benefactor who endows the work I"m doing and not only provides funding for the next few years, but provides funding that moves this into one or more universities where it grows for the next 50 years. Using tools like NodeXL we should be able to map this process. 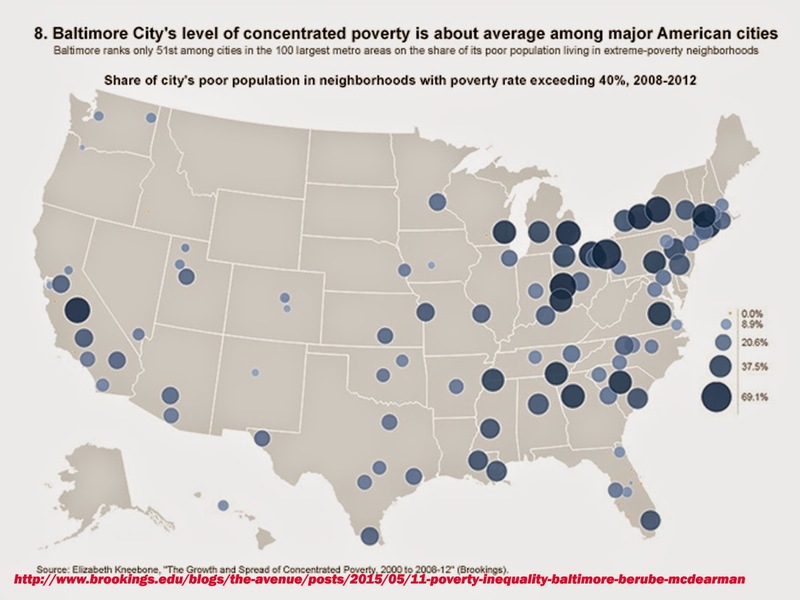 Last week I posted an article talking about visualization strategies and encouraged readers to pass this on to others who might help us do the work, and share the tools and ideas with other cities. I'd like to follow that up with an invitation for readers to look at the mapping strategies I've been developing since 1994. The map above was created using an interactive map found here. This map uses poverty data and information on poorly performing Chicago public schools (from 2007 data). 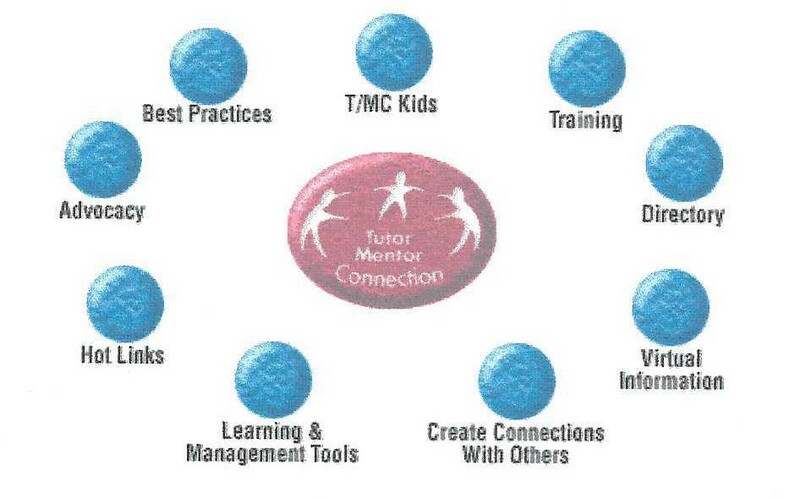 It shows locations of known non-school tutor/mentor programs, from the surveys done by the Tutor/Mentor Connection. And it shows assets who could be working together to help tutor/mentor programs grow in the map area shown. Assets are businesses, faith groups, colleges, hospitals, political leaders, etc. Every neighborhood has a different mix. You can see more maps made using the Program Locator, on this blog, or on the Tutor/Mentor blog. Visit the map gallery, and see similar maps, but made using donated ESRI software. I created another wiki page, just focusing on the Program Locator, and current challenges. While I'd love to have volunteers, partners and leaders form Chicago step forward to offer time, talent and dollars to help me do the work described in these wiki pages, this map shows that cities throughout the country have some of the same problems that we face in Chicago, meaning leaders from any city could step forward to help develop the program locator and our mapping capacity, with the goal of applying the strategy in their own cities. In fact, big cities throughout the world face the same challenges, so teams from anywhere could be helping me do this work. Actually, they already have been helping me. The program locator was created in 2008-9 by a team from India. 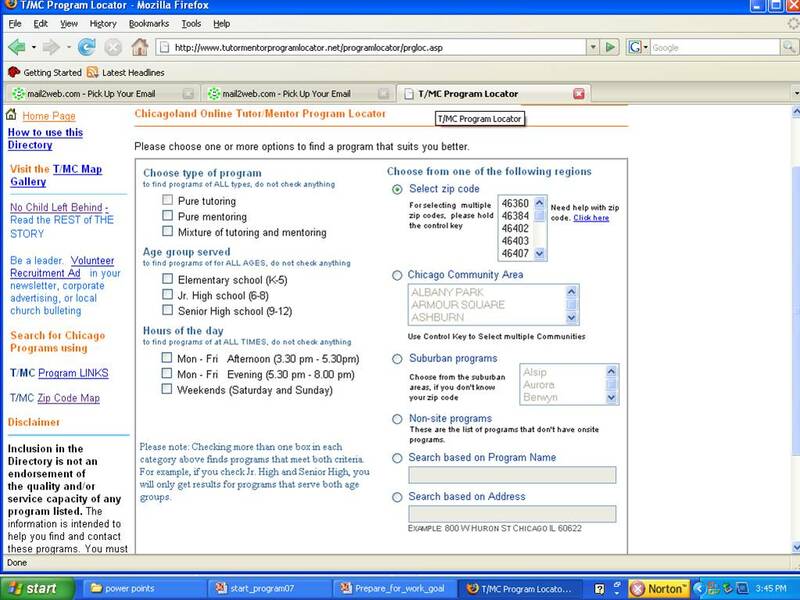 The first on-line directory was built by a student from India in 2004. An intern from South Korea helped update one section of the program locator in 2014. This work could be a project of a team of students/faculty and alumni from a college or university in any of these cities. It just takes one or two inspired people to see the potential and begin to build support for the idea. If you're one of them, I look forward to hearing from you. 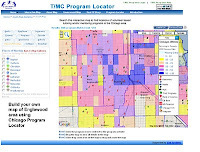 In this blog, the Tutor/Mentor blog and the Tutor/Mentor Institute, LLC web site I've included maps and visualizations that are intended to support the decisions and actions of thousands of leaders in Chicago and other cities who want to reduce poverty, violence, inequality and health disparities by increasing the number of opportunities and supports that are available to kids living in high poverty areas from when they are born, to when they are launched 25 or 30 years later in jobs and careers. 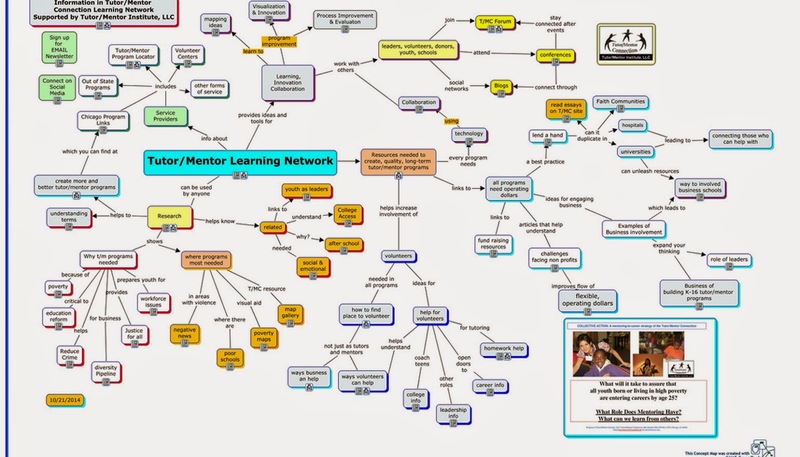 In this article I include the concept map shown above and explain the four parts of a problem solving strategy that I've piloted, since 1975 when I first began leading a tutor/mentor program, and other can adopt. I've added elements to the map that show work that needs to be done to not only sustain what I've been doing since 1994, but to enhance it and pass on leadership to youth in many locations. I encourage readers to dig through this information and build your own understanding. Use it to support the growth of mentor-rich programs in Chicago and other cities. If a few of you share these articles with others, with your own interpretation, and they share them with people in their own networks, we eventually can reach one or a few benefactors and/or leaders who can make the $25 to $50 million dollar long-term investments that make this an Institute on a college campus, or make it a stand-alone institution that can have far greater impact than it has had over the past 20 years. If you'd like a guided tour of the information on the web sites just connect with me on Twitter, Facebook or Linkedin, or leave contact information in the comment section. If you're in Chicago we can meet face-to-face. If you're in another city we can meet on Skype of a Google hangout. This map is one of many concept maps you'll find on the NASA Asteroid Redirect Mission App . 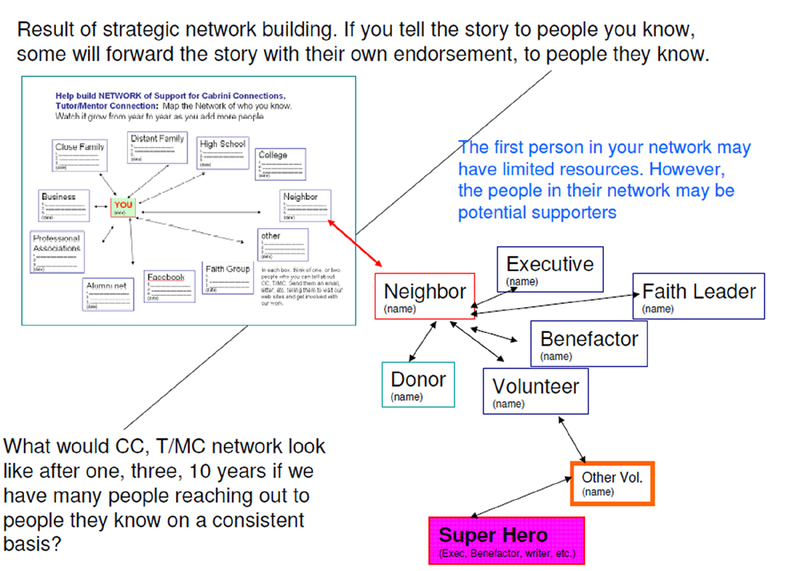 I've been using concept maps for nearly 10 years to communicate strategy. I wrote a series of articles starting in October 2014 to show how these maps could communicate a strategy for leaders to follow in building and sustaining mentor-rich programs helping kids born in poverty move through school and into jobs and careers. A couple of my maps were converted to flash animation, but I've never been able to create an audio version using Cmap tools. Browse through the NASA web site and you'll find some excellent ideas for the potential of these maps. 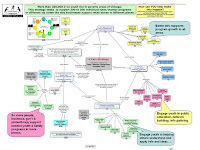 See my entire concept map library at this link. In the articles on this blog and the Tutor/Mentor blog I repeatedly show how maps can be embedded in stories that show what happened, where it happened, and what people can do to help prevent it from happening again in the future. 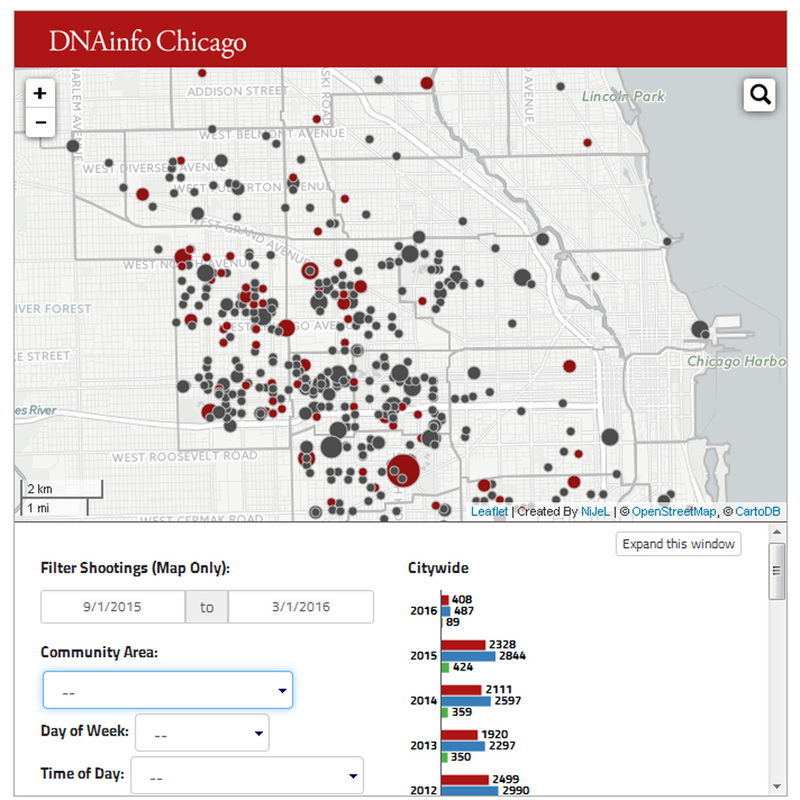 Below is an interactive map, hosted on the DNAinfo web site, showing shootings in Chicago since January 2010. 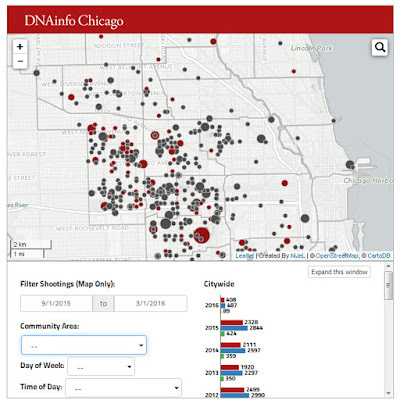 Use this and other interactive mapping platforms to show areas of Chicago where high concentrations of poverty lead to a multitude of problems and where volunteer, donor and public support are needed to help residents overcome those problems. 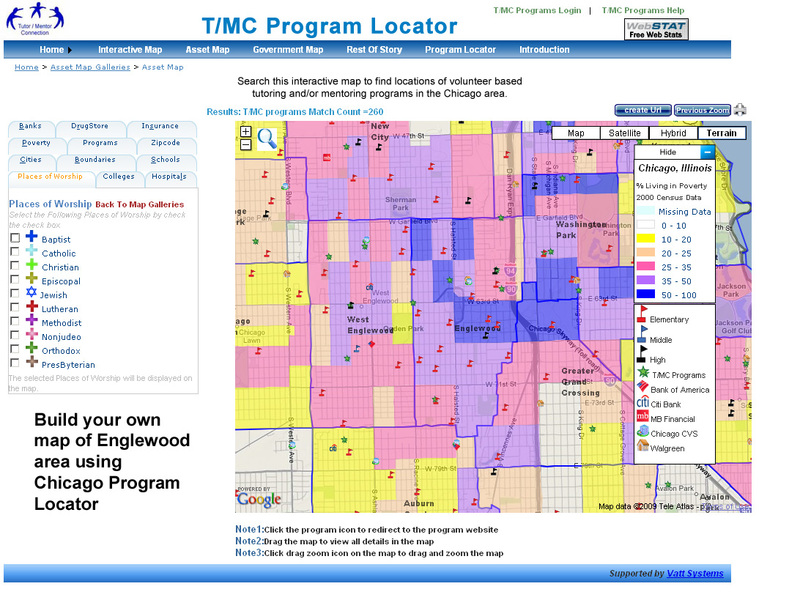 Using the Tutor/Mentor Program Locator, created in 2008, people have been able to zoom into neighborhoods, build overlays showing poverty, tutor/mentor programs (if any) and assets who could be helping programs grow in the area. While the Program Locator is not updated due to financial challenges, this "how to create a map story" guide, can still be useful, showing how map stories can be created using any of the data platforms that are now available. If you're creating stories using maps, post a link to your stories in the comment section below.